Companies that can manage transformation effectively are usually more successful than those that cannot. Numerous companies are aware that they should improve the processes to manage transformation effectively but don't know how. Such companies generally either spend a lot on many duplicate and unfocused efforts, which bring little or no benefits; or spend small amounts on process improvement, mainly because they are not sure how to proceed. Most enterprise architecture software offers little support for tracking of EA maturity. But usage of enterprise architecture software itself indicates a sign of maturity. See below for more details. -	They describe what any company has to do in order to improve procedures. -	They form a proven framework for management of the improvement efforts. -	They provide a comparison for periodical measuring of improvements. -	They organize different procedures into the levels, where each level represents an improved ability to control and manage the EA development. Assessment of the company's practices against the model is used to determine the level of EA development in the enterprise. It shows the company's ability to implement EA in the area of concern and highlights the practices on which the company should focus to achieve the highest return on investment. Currently, there are several Maturity Models in use, but Architecture Capability Maturity Model (ACMM) from US Department of Commerce is widely accepted as a standard. There is no formal Enterprise Architecture practice in place, or EA practice is just starting. Any EA work is conducted informally and in most cases undocumented. No enterprise architecture tools are being used. There is an Enterprise Architecture practice in place and is typically focused on ad hoc technical problems within the projects. Architecture is mostly used to address issues in the company, instead of being a method linked to the vision of a future state. Enterprise Architecture is in place, and it's providing benefits to the business. Companies at this level have IT vision, principles, standards and are linked to business strategy. However, there are no managed processes that guarantee long-term success nor linkage to Target Architecture. The EA is delivering results repeatedly; the elements of the company's digital business are supported by building on the business-outcome-driven EA platform. The architecture is well defined and presented to IT department. Documents related to EA are regularly updated. Organization in this level is starting to think about using enterprise architecture tools. EA has become a natural way of company's functioning. The EA models and approaches are widely adopted. Enterprise Architecture supports the company's business strategy, and capital investments are adjusted according to the feedback received from EA. This is the sweet spot for enterprise architecture software as well. The organizations in this level are prime candidates to leverage enterprise architecture software to further evolve their maturity. Optimization and continuous improvement of EA processes become priority. Senior management is involved in optimization process as well as architecture governance and development. Feedback from EA and IT metrics are used for improving architecture process. 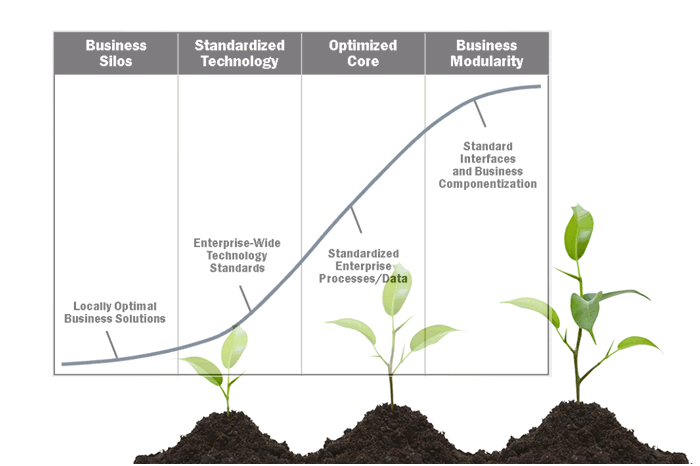 Companies should know their maturity level at any moment and use it as a guide for increasing EA Model Maturity. Higher EA maturity enables the realization of many different benefits. Also, understanding the level of EA maturity can allow companies to set expectations and goals accordingly. keywords: enterprise architecture tools, enterprise architecture maturity models, enterprise architecture software.